edge and a brisk, quick, crisp edge. Being is a shape without edges. The idea for this exhibition began in 2013, while I was researching the late-1950s poetry and painting scene in San Diego for my master's thesis. Guy Williams (b. 1932 - d. 2004) was a participant in this scene, along with Richard Allen Morris, John Baldessari, and Malcolm "Mac" McClain (who was the subject of a solo exhibition at my gallery in 2014). I viewed Williams's 1961 Painter's Notebook, in the collection of the New York Public Library, and I remember thinking that his "Name a shape..." poem would be an interesting starting point for a group show. Crisp Edge, Fuzzy Border includes an original copy of Williams's Painter's Notebook, works by three gallery artists (Scott Alario, Rachel Higgins, and Goldschmied & Chiari), and works by three contemporary artists from outside of the gallery (Donna Chung, Brock Enright, and Kelly Jazvac). Contemporary artists' works were selected based on three criteria related to Williams's poem: a crisp edge, a fuzzy edge, and a relationship to the idea of being. 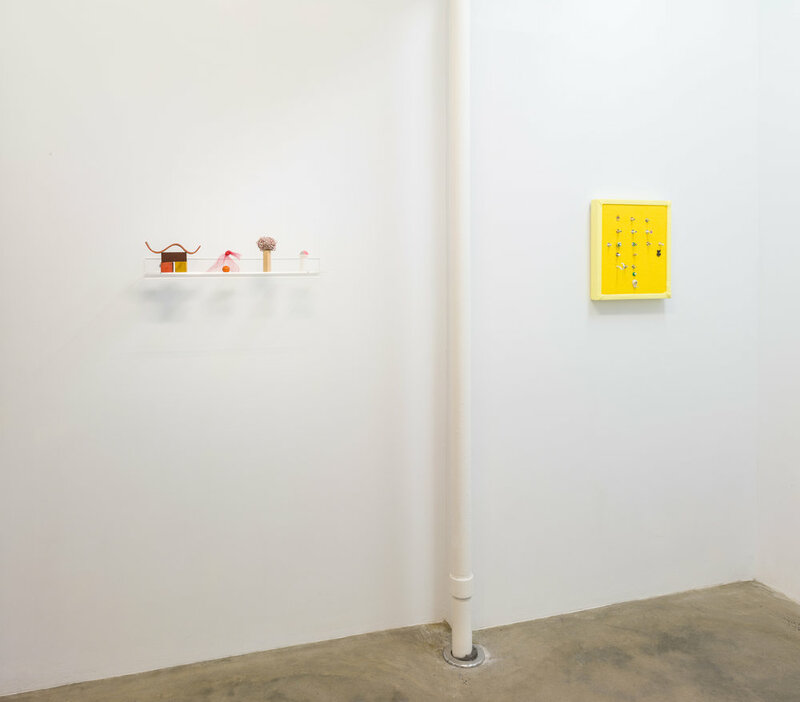 Works by both Chung and Enright include visually arranged found materials--netting, yarn, and a wall hook, for example--set upon alternately crisp and fuzzy surfaces - a slick horizontal shelf (Chung) or felt (Enright). Jazvac's Untitled (found objects) are disused billboard vinyl prints, taken down from their original location and wrapped into colorful, crinkled rectangles. 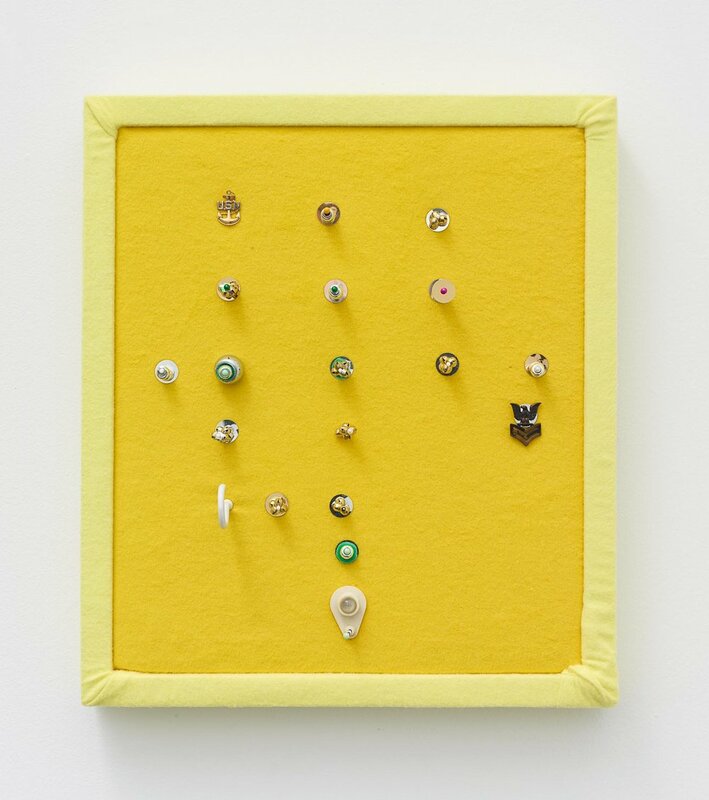 Goldschmied & Chiari's Untitled Portrait, incorporates the image of the viewer and surrounding space into its surface, blurring the distinction between object, body, and space. Higgins's sculptures, "Plinth," "Soap Box," and "Figure," include rectilinear and curving forms and may be used as vessels or seating. In Scott Alario's photograph, "Ends of Our Noses," a child touches a sheet of paper to her nose, relating touch, smell, and sight to the blank page.